From a shaded retreat on John’s Bay in the Mobile-Tensaw Delta to the boardwalk atop the highest mountain in the state, the Alabama State Parks System offers an incredible diversity of nature’s wonders to explore. Just north of the point where the Mobile-Tensaw Delta and Mobile Bay converge, Meaher State Park offers a respite from the hustle and bustle that can be seen in the distance on the Bayway crowded with frustrated travelers. Tall pine trees blanket the 1,300-acre park that borders the Delta’s biologically rich John’s Bay to the south and Ducker Bay to the east. According to Anna Bryant, Meaher’s new park superintendent, visitors head to the park with their travel trailers in tow, attracted to the shade on the water’s edge. A native of Auburn, Bryant came to love the area while teaching environmental education for two conservation organizations and jumped at the Meaher job about a year ago. 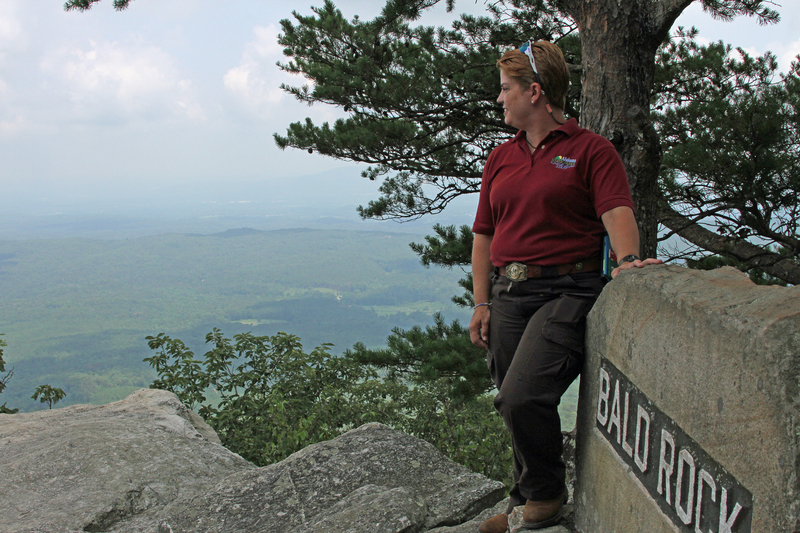 Callie Thornton, the assistant park superintendent at Cheaha State Park, finds her therapy in the mountains, and Cheaha, completely surrounded by the Talladega National Forest in northeast Alabama, is the perfect location for her. Already a dedicated backpacker before she took the job at Cheaha a year ago, Thornton now gets to share her love of hiking with an abundance of park visitors and fellow hikers. “What attracted me to Cheaha was the mountain and the Pinhoti Trail,” said Thornton, the former Town Clerk at Rockford, Ala. “I wanted to be able to teach others how to backpack, the importance of being outdoors and inspiring others to love the outdoors. Thornton’s instructions include camp cooking, first aid, what’s needed in your backpack and, possibly more important, what’s not. “I’ve been able to get my backpack down to 27 pounds for a seven-day trip,” she said. “If people will bring me their backpack, I will go through it and divide and conquer, as I say. I advise them on what kind of gear they need as far as shoes and clothing. A lot of people think they need to take multiple days of clothes. If you pick the right gear, you might need an extra pair of socks, but you don’t need anything else. At one time, Cheaha was the southern terminus of Thornton’s beloved Pinhoti Trail. That terminus has since been moved about 60 miles south to Flagg Mountain. The Pinhoti Trail covers about 170 miles in Alabama and 166 miles in Georgia before it connects with the Appalachian Trail. Hikers can also gain access to the Eastern Continental Trail that transits the entire eastern U.S.
Thornton, also president of the Alabama Pinhoti Trail Association, hopes to bring more exposure to Alabama’s Pinhoti segment. “We don’t get a lot of publicity on the Alabama Pinhoti Trail,” she said. “Georgia’s trail gets a lot, but Alabama’s doesn’t. It could be a big tourism booster for Alabama. On a hot summer day, a bonus of being at Cheaha is the weather. Another attraction for Cheaha visitors is the solitude of the mountain, which is 2,407 feet above sea level, the highest in the state. A variety of accommodations await, from cabins and chalets to improved and primitive camping. Now hop in your vehicle, come down the mountain and head south about 260 miles to Meaher State Park to experience Alabama’s coastal plains and the expansive Mobile-Tensaw Delta. Meaher offers 61 improved campsites, 10 improved tent sites, a couple of primitive tent sites and four cabins. Two more cabins will be available later this year. Bryant said Meaher appeals to campers in a couple of different ways. “We’re kind of a quiet park,” she said. “We don’t have a pool or tennis courts or facilities that some of the bigger parks have. The fact that people can come and relax, see the sunsets and see the water is a big attraction for our overnight guests. But we also have a lot of day visitors who love to fish. We have a fishing pier and a boat launch. They can canoe and kayak or take their motor boat into the Delta or Mobile Bay. We also have the Gateway to the Delta boardwalk that allows visitors to see the Delta from a different perspective. Because of its size, Meaher doesn’t have a park naturalist, but Bryant has been able to utilize the environmental programs from Gulf State Park and 5 Rivers – Alabama Delta Resource Center, which is located directly across the Mobile Causeway from Meaher. Bryant will soon be involved in a park expansion, thanks to a $3.5 million award from the Deepwater Horizon’s oil spill through the RESTORE Act. Visit www.alapark.com/cheaha-state-park and www.alapark.com/meaher-state-park for more information.